As can be seen on the map below, Gatwick Airport is Horley's neighbour. The other nearby villages and towns, such as Charlwood, Copthorne, Crawley, Smallfield and Burstow are all effected by the presence of this major airport. A large and thriving business community has built up around Gatwick. Many local people work at the airport, a substantial bus system links the housing developments and many people benefit from the economic effect of Gatwick. There is a lot of local concern about the possible expansion of Gatwick. There are concerns about air quality, noise and how the local roads will support more traffic. Gatwick Airport work with the local community. They provide a Local Residents Parking Scheme and publish news for local residents. Gatwick Airport Community Trust (GACT) award grants to the local community. Below is the latest (2018) information on the proposed use of the current Gatwick Standby Runway for departing flights, proposed to start in 2019. 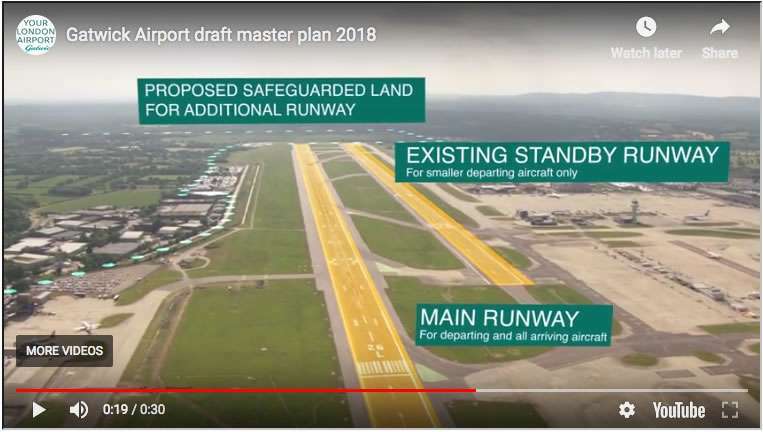 This is taken from the Gatwick Airport draft master plan 2018. A consultation process is underway and public exhibitions are being held at the following venues. For full details of the above visit this Gatwick Airport page. The consultation can also be responded to online at this link. Click here to visit the Gatwick Noise Lab. Click here to visit the Gatwick Airport website. Some serious problems have been reported where people have alleged that their cars have been damaged by unapproved parking companies. London Gatwick’s approved off-airport parking scheme was introduced to offer passengers more confidence and guidance when choosing off-airport parking. When travelling from Gatwick Airport we strongly recommend either using one of the official Gatwick car parks (on the airport) or alternatively an approved off-airport parking supplier as listed on Gatwick's approved off-airport parking page. New local campaign about noise and problems. Residents living North of Gatwick, from Newdigate, Capel, Leigh, Norwood Hill, Sidlow, Salfords, Outwood and Horley, have come together to form Plane Justice, a collective which seeks to support (whether through communication, discussion, or legal process) those who are, or would be, newly affected by aircraft noise. Click here to visit the Plane Justice website. 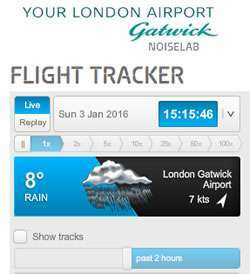 Gatwick have launched a new Noise Lab and Flight Checker website. It shows an impressive range of information that will enable you to enter your location and see information on nearby flights and noise levels. It has the facility to look at the history of noise events per day, a map showing incoming and outgoing flights and lots of other related info. Click here to visit the Gatwick Noise Lab.